As a Mom, and as a person with a Bachelor of Science in Biology, I am so interested and amazed by the differences in my daughters. While they look similar, they are almost night and day different. Their personalities, preferences (food especially! ), and just general attitudes are so dissimilar. I had created a post about how much I don’t know about raising these girls. Today I want to talk about their bedtime routines. Emma, my first born, was a nightmare for sleep right from the get-go. She would only sleep when held, would only fall asleep while nursing and we co-slept so I could get some sleep too. As we approached her first birthday we decided she needed to get out of our bed so I could get some real sleep when I went back to work. We did cry-it-out. I cried almost as much as she did. It was awful for a week or two but it worked, until she was old enough to demand “more stories” and be in a toddler bed she could get out of. Her toddler years bedtimes sometimes were an hour or more. And I’m a softie, especially at bedtime – I don’t want them going to sleep sad or mad! So would read 100 stories a night. Okay, maybe only 10 but that’s a lot, especially when there’s a new baby in the house who needs you too! Now that Emma is almost 8 the bedtime routine is vastly different. 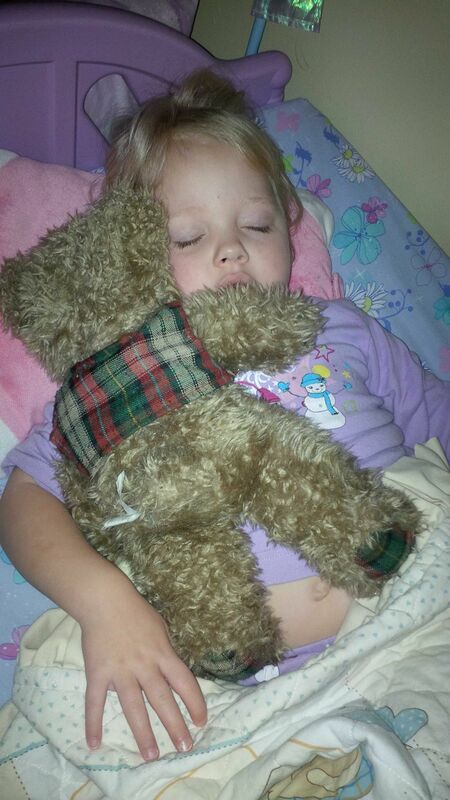 Around the age of 5 she started realizing that sleep is a good thing. She still (then and now) likes a lot of reading at bedtime, but she can read to herself now. This really helps me escape her room after only 2 or 3 short chapters in a book. Before her reading ability increased we had a box under her bed with colouring books and markers that she was allowed to play with, quietly, when she wasn’t ready for sleep, but I was ready to be done reading. It actually worked well, especially when I was still nursing her sister at bedtime. As a baby she fell asleep anywhere – in your arms, in the car, in a crib, or on the floor. I was so astounded the first time I left her playing on the floor during Emma’s (long, drawn out) bedtime routine, and when I came back she was sound asleep! (The image at the top of this post is from that night I found her asleep on the floor. The caption I had on FB said “I took so long with Emma, Rose put herself to sleep. (I’m still not sure Emma’s going to go to sleep…)”) That perfectly sums up the differences in their sleeping habits! Rose is now 5 and she still has a very short bedtime routine compared to Emma. We change, do teeth, and then read one book. Lately it’s a Chirp magazine – and likely the same one we read last night. She enjoys the activities almost more than the stories in magazines. Mazes, find the object pages, and anything she can trace with her finger are her favourite. And she’ll let me stop reading if she thinks I need to. When I get a cold I can exaggerate the froggy throat and she’ll tell me to stop reading because “You’re losing your voice Mommy!” I’m not ashamed to admit I use that to my advantage on nights I’m not feeling so well. There was a short span of time where Rose would come out of her room 40 times between the end of her routine and the end of Emma’s. Okay, maybe that’s an exaggeration, but some nights it sure felt like it! Luckily, Emma is very easy-going where Rose is concerned, and anything that makes Emma’s bedtime longer is a bonus in her mind. I’m happy to say Rose has grown out of the get-out-of-bed stage. What time do my girls go to bed? Emma didn’t have a set bedtime until she was at least 2. We tried when she was younger to get her to bed so we could have some time before we went to bed but it wasn’t worth it. Once she started to understand bedtime routines we tried to get her to bed by 7pm as a toddler. Sadly, that’s a 7pm start to the bedtime routine. Often we weren’t done until almost 8:00. That quickly moved to 7:30 start, and then 8 as she got to school. Now we still try to start her bedtime at 8pm and that works if she’s had a busy day. I try my best to be out of Emma’s room by 20 after 8, but realistically it’s often 8:30. Then she gets to stay up reading if she wants (and she always wants to!) Truthfully I’m not sure what time she turns her light out most nights. I do know if I hear her stomping around after 9 I go check it out. I don’t often find her up at that time, and what I heard is often a book falling off her bed! And I’m pretty sure she’s getting enough rest as she gets up on her own after about 10 hours of sleep. Rose is vastly different, of course. She needs a lot of sleep and she tends to be an early riser. She used to wake up at 6am all the time. Even when I tried pushing her bedtime later she would still wake early. Now, at 5 years old, we start the bedtime routine at 7 and it’s rare we aren’t done by 7:20. Then she sleeps until about 6:30 am, which is great because most mornings I have to get up then anyway. Especially when there’s school! Now that it’s summer I’m letting Rose stay up a bit later – starting the bedtime routine around 7:30 (8 on some nights) – and I find she’s sleeping in a bit longer to make up for the late nights. If the girls aren’t kept busy in the evening (say if they decide to watch a movie after a busy day instead of playing outside) Rose starts looking ready for bed at about 6pm. I will NOT put her to bed that early because she will be up at 5am once she’s had her regular amount of sleep. I so don’t want to deal with that! How are the bedtime routines in your house? Share with me your household bedtime routines. I’m curious about other families, their schedules, and how much reading they have to do at night! What time do your kids go to bed? Do you feel they get the sleep they need? Did they go through those annoying stages like mine did (1000 stories? getting out of bed 100 times? getting up crazy early?) Please comment with your woes and your successes at bedtime! PS – If you like the photos of my girls sleeping, follow me on Instagram. I tend to take a lot of funny sleeping poses pictures and share them there! It’s so great when you can get into a bedtime routine! I hope your little one settles into bedtimes easily for you. Having a few hours to yourself really can’t be beat when you have kids. Thanks so much for the comment! Hahaha! I hope your little ones don’t stay in your bed too much longer. I know how that is, it makes a for a full house for sure! I’m sure the day will come when you can check in on your kiddos in their own beds. Sometimes its just best to do what works for you, right now. Thanks for the comment Lisa! I had a first born called Emma who just wouldn’t sleep! I wonder if it’s a universal trait? The son is simple and goes to bed at 7, takes a while to get off but will sleep for 12 hours! Hmm – I’ll have to find some others with Emma’s to see if the trend continues! I’m glad to hear your second is a bit easier as well. Somehow having the restless one first makes things easier going forward. At least it did for us! Thanks for the comment Jenny. My 9 month old daughter was able to sleep on her own until about 6 months. I could just lay her in her crib, she’d close her eyes and doze off. After she started teething, all of that changed. She could be dead tired and if I lay her in her crib she will stand right up and bang on the railing with her little hands. Only 2 things work for her now. She lays on her daddy’s belly and she falls asleep there. Once she’s asleep we can put her in the crib for the rest of the night. The other thing is me crossing my legs Indian style and laying her on them. With some slight rocking or shaking of the legs, she’s asleep. Interesting sleep regression Miriam. I hope she goes back to self-soothing for you soon! Teething can be a serious battle for some kiddos. At least she stays asleep once she gets there. When I tried to move my eldest she immediately woke up. That wasn’t fun. Thanks for stopping by and sharing a comment! 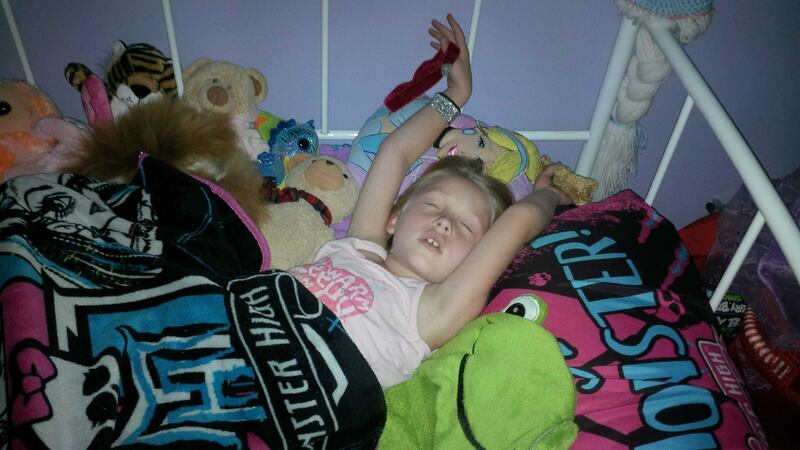 Eeek, your girls have really put you through it at bedtime haven’t they?! Although as you don’t know any other way, it must feel so normal! I’m always in awe of people who had another baby when their first baby was a nightmare sleeper-I don’t know if I’d have had it in me!! I have been very lucky with my boys. The eldest was a nightmare as a tiny baby, he grizzled most of the evening, then moved to full on screaming from 10pm o 2am. But by 8 weeks, he’d settle himself by 8pm, and sleep till 8am the next morning! By 6 months, he went to bed at 6.30pm and slept all night. The second baby was also sleeping at 6.30 by 6 weeks old, waking in the night for 2 feeds until he was 10 months. The eldest has 1 bedtime story, then falls fast asleep, and we offer the youngest a story which is usually refused, and ‘no, just bed’ requested instead! We are very lucky, but they are pretty much monsters all day, shouting, screaming, moaning, fighting, tantrums, that I think I deserve some kind of decent pay off for dealing with that!! I can’t imagine what it would be like to have a baby sleep through the night that young – at least a first baby anyway. Rose started sleeping long stretches fairly early on as well! And I don’t know if I could handle “monsters” all day. It’s amazing how everything is different for everyone! I’m sure you enjoy your evenings after those easy bedtimes. Thanks for the comment! Routines are great – I think all kids thrive best with them. (That’s just my opinion, I know some who don’t do routine at all!) I also enjoy that you can slip a bit in the summer and no one really gets too upset about it. Thanks for leaving a comment! I wish I could get my 7yo to get into bed by 7. It would be much easier (and bedtimes would feel much shorter for me!) Isn’t it great when they can read to themselves? Thanks for stopping by Charlotte! It has been a long time since I had to worry about bedtimes for my two sons, now 24 and 20. I remember our oldest would go right to sleep around 7pm but would wake up around 2am and demand attention. We finally learned to keep him awake later so he, and the two of us, could sleep through the night. Our youngest was never a problem with sleep. It seems like he was sleeping through the night very early on. Seems to be a bit of trend – the second being the “better” sleeper. It’s hard to figure out the kids early on, especially when they can’t tell you what’s going on with their little bodies. Thanks for sharing your bedtime stories! I always love to read about what other people do at bedtime. My daughter is three now – we have a very long easy bedtime routine from 6.30pm and she is in bed at 7.30pm. BUT she was a shocker as a baby so I think we’re getting our time now! Talya – that made me chuckle. It’s great when the kids finally figure out what they need to do for bedtime, and you get a routine that works! Thanks for sharing your tale! I don’t think I mentioned in the post but my first never napped. I would drive the car every day so she would get a little daytime sleep. I’m loving all these stories – it’s so nice to hear others struggled at some points too. Thanks for sharing your story! We have a bedtime routine with our 6 month old, starting with a story, bath and then a feed. I hope we can keep it up as it’s working well at the moment, but I think it’s because our son is well suited to it, a sibling could be different!